Once you receive the bid request and after you have pre-qualified the customer and pre-qualified the job so you are confident that the job fits your business niche, you must carefully read the electrical bid request to ensure that you can perform the work as requested. The scope of work to be performed must fit the kind of job and materials your company can deliver. 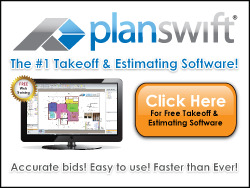 Obtain a full set of plans and specifications and make notes of all information required. Check the electrical bid form - Determine the base bid scope of work and any alternate bids that require you to add or delete scope of work, price breakouts or other requirements. Read specifications and make notes - Look at all specification sections to determine any additional work required by electrical in mechanical, plumbing, communications, general conditions or any other sections. Many times, you are required to perform work that is not listed or shown on the (E) Electrical sheets and you would not know it without looking at the other plans and specifications. Don’t get stuck with work obligations in other specification sections by failing to read the specifications. Tip - Often times you will take the plans apart to make copies of them or to have lighting and switch gear vendors quote the plans. Before you take any plans apart, sequential number the plans (use a magic marker and mark each page at the bottom right). Many architects and engineers use a coded plan numbering system that is not sequential and, once you have taken the plans apart you cannot always determine if a plan sheet is missing! If a plan sheet is left out or missed, it can be a very costly mistake! By reading the specifications and determining the scope of work in advance, you get esential information about what you must include in your price.